Former two division champion Conor Mcgregor isn’t shy away to show his face in public after getting beaten by undefeated Khabib Nurmagomedov at UFC 229 earlier this month. Last week, Mcgregor invaded the Cowboy Stadium in Dallas, where he got to meet a bunch of the Cowboy players and play a little catch. Then yesterday (Sat, October 20, 2018) McGregor showed up at Boston’s Back Bay fire station where he handed out 10 Boston firefighters with World Series tickets. He even slid down a fire pole at the station wearing the suit and fireman’s hat as well signed his whiskey Proper No. Twelve bottles. Next Mcgregor was seen at the TD Garden where he surprised Irish boxing champion Katie Taylor backstage before her title defense. 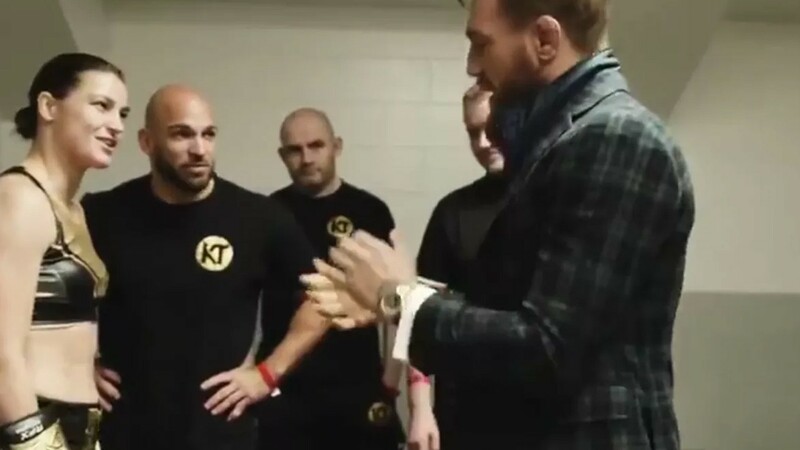 In the video below, Mcgregor paid a visit to Taylor’s dressing room where he showed her some love before she made the walk to the boxing ring. Katie Taylor remained undefeated went on to successfully defended her WBA and IBF titles via a unanimous-decision win over Cindy Serrano. After the win, Katie extended her streak to 11-0. Mcgregor also got a chance to take a photo with boxing ring announcer Michael Buffer a brother of UFC ring announcer Bruce Buffer. After tasting a defeat Mcgregor has called for the rematch, but it seems he’s not getting an immediate showdown as UFC president Dana White said he wants Ferguson vs Khabib next. Before Mcgregor lands any fight he has to appear in front of Nevada State Athletic Commission (NSAC) on October 24 to determine the punishments for his role in UFC 229 post-fight brawl. Mcgregor seems more focused on promoting his newly released Proper Twelve Irish Whiskey then getting his title back.